One of the most important days of your life is the day when you get hitched and you probably don’t want to ruin that day. For this reason, you definitely have to find one of the most alluring wedding invitations for your big day and nothing could be more alluring than the embossed wedding invitations. 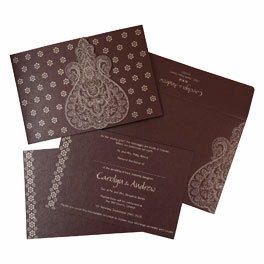 These invites are too elegant and graceful that it leaves anyone enthralled. With the textured details and ornate designs, emboss theme invitations feel truly luxe and we offer a wide variety of these stunning invitations at 123WeddingCards. Designed and crafted with intricate detailing and luxurious textures, every invitation at our store is unique and elegant. Once you browse through our intensive collection of embossing theme wedding invitations, you would feel bliss like never before. Wonderful and beautiful invitations are available with matching and equally beautiful save-the-dates and all the other wedding stationery to take the wedding invitation suite to a completely new level. With added component of glitter, laces, flowers and tulle, these stunning emboss theme wedding invites with finest quality printing process adds a big dose of elegance in your wedding. Other than these stunning invitations, we also offer laser cut wedding invitations, traditional wedding invitations and much more. To make your shopping experience with 123WeddingCards more memorable, we offer you the option of customizing your wedding invitations that allows you to choose your own colour, designs, paper, process and wedding wordings for your personalized invites. 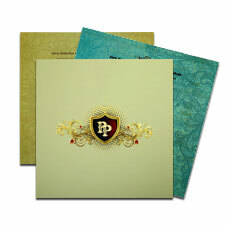 Choose from our widest collection of wedding invitations to make an impressive first impression on your wedding guests.